Like the man himself, Edgar Martinez baseball cards maintain consistent production and stretch across a long period of time. The top designated hitter of the 1990s, his bat brought the first taste of playoff success to the Seattle Mariners. 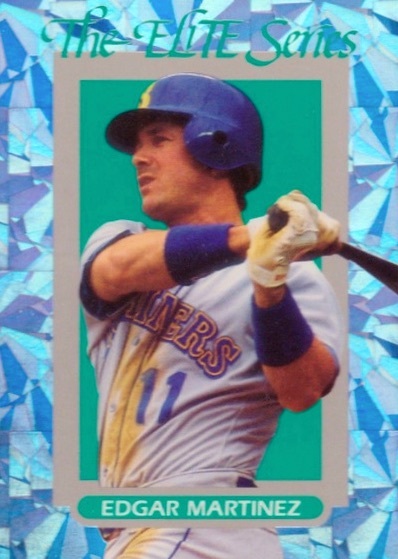 With many choices available, some of the best Edgar Martinez baseball cards can be viewed below, including notable releases from the 1980s and 1990s. Martinez spent his entire 18-season career with the Seattle Mariners, earning a reputation as a fan favorite and the man who kept the Mariners in Seattle. Originally at third, Martinez severely injured his hamstring and became a full-time designated hitter in 1995. He excelled at the position, becoming the first and only DH to ever win a batting title with a .356 average in 1995. Named Outstanding Designated Hitter five times over his career, Major League Baseball renamed the award in Martinez's honor in 2004. 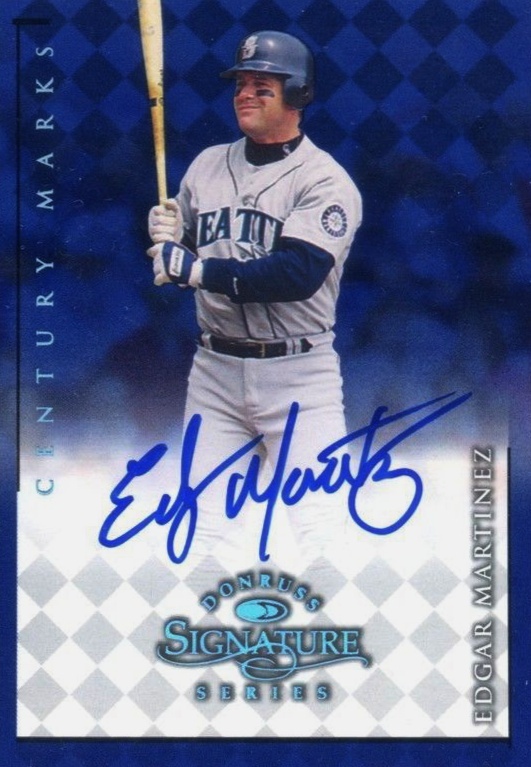 Shop for Edgar Martinez autograph cards on eBay. While Martinez is known as a generous in-person signer for fans, he is also a frequent signer for Topps and Panini products. As far as earlier releases, a remarkable combination autograph featuring Martinez came in 2008 Upper Deck Premier where he is paired with his former teammate Ken Griffey Jr. 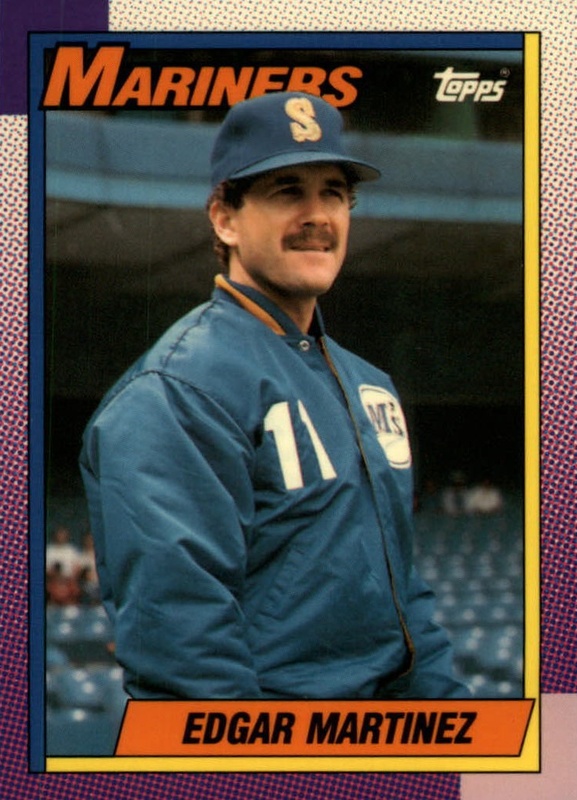 In addition to a notable Edgar Martinez error card that cracked the list, he has another error card from his pre-rookie card days. In the 1990 CMC AAA set for the Calgary Cannons minor league team, Edgar's photo features Mariners prospect Tino Martinez by mistake. With most of Martinez's career spent as a designated hitter, some question his credentials for the Hall of Fame. But after several years of steady increases on the ballot, he finally got inducted in 2019. 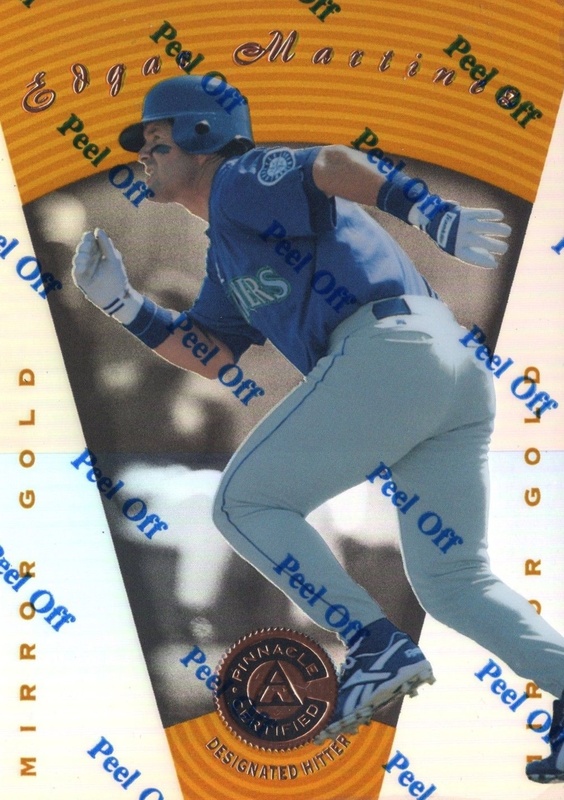 Mainly built around value, but also taking design and hobby relevance into account, some of the key Edgar Martinez baseball cards are showcased below. A focus is placed on his earliest cards from the '80s and '90s. 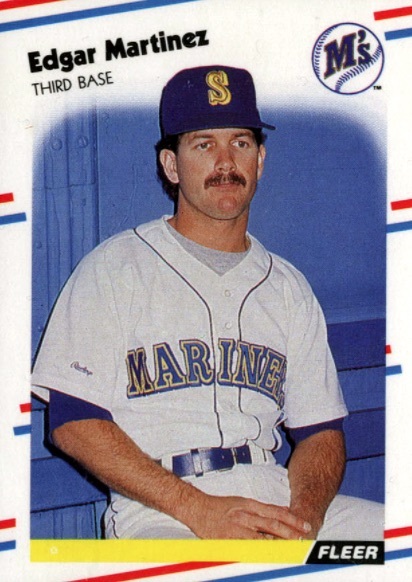 One of the early Edgar Martinez baseball cards doesn't feature him at all. 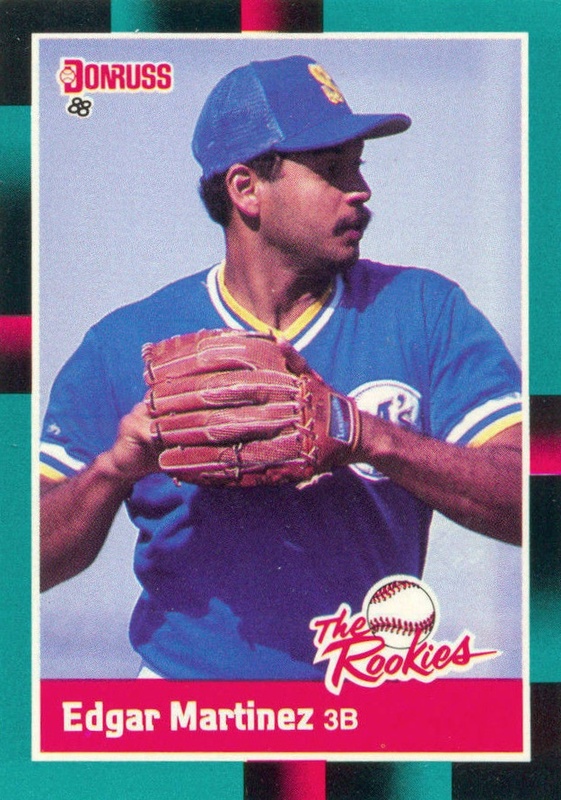 His 1988 Donruss The Rookies image is actually of Mariners reliever Edwin Nunez. Both Mariners players did sport bushy mustaches at that time in their careers, so the confusion is somewhat understandable. The Rookies sets were Donruss' version of the popular Topps Traded sets. Each of the 56-card sets also featured a complete Donruss Diamond Kings puzzle, with 1988 offering a Stan Musial puzzle. Although Martinez had already played in parts of three seasons and appeared on cards for just about every other card brand, he would finally make his flagship debut in 1990 Topps. As is the case for most rookies in the 1980s and early '90s, the key version for collectors to buy is the high-gloss Tiffany edition. Being printed on white cardboard gives the card a slightly different coloring and it is estimated just 25,000 sets were created. Fans looking for an Edgar Martinez card with the 1989 Topps design should check out 2014 Topps Archives. Featuring a protective plastic shield placed over the front of the card, the 1997 Pinnacle Certified set features four main parallel versions: Red, Mirror Red, Mirror Blue, and Mirror Gold (shown below). There also seems to be an unofficial Mirror Black parallel that collectors have found in packs but it was never officially confirmed by Pinnacle. Collectors theorize there might be as few as one Black Mirror card for each player on the checklist. Martinez is shown leading off from first base and looking to steal second on his 1991 Topps Desert Shield card. Gold foil stamped, typically in the upper-right corner, these cards were provided to military general stores and to servicemen and women serving in Operation Desert Shield. There are estimated to be about 6,800 copies of each base card. 2016 Topps Archives features a tribute to the original Desert Shield cards that were super short prints and Martinez is included. The Elite Series cards were randomly inserted into packs of 1993 Donruss with cards #19-27 in Series One and cards #28-36 in Series Two. The Elite Series used continuing checklist numbering from year-to-year with the first cards from the set appearing in 1991 Donruss. 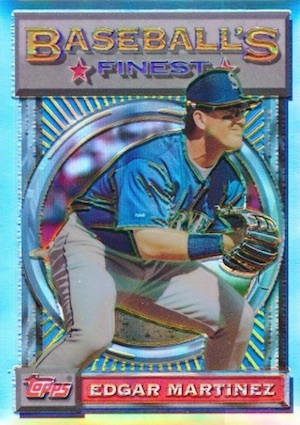 The holographic foil accents the blue of the Mariners jersey nicely and each card is serial numbered to 10,000 copies. 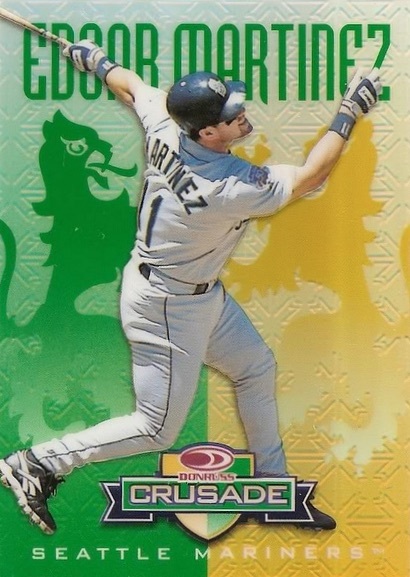 Part of a larger 130-card set, the first 40 cards in the Crusade line were inserted into packs of 1998 Donruss Series 1. Although Martinez is card #42, his card was still available in Series 1 as the distribution over the '98 Donruss products did not follow the exact checklist numbering. Versions include Green (#/250), Purple (#/100) and Red (#/25). 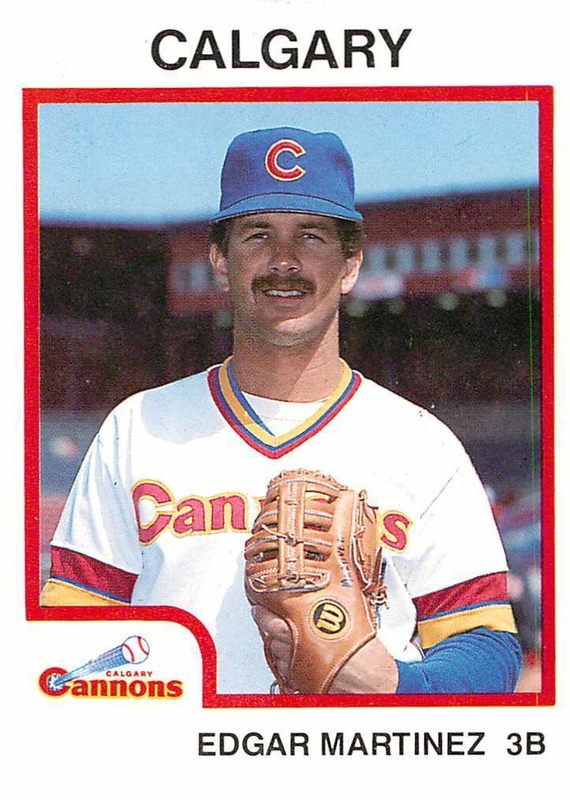 Although Martinez does have a ProCards appearance from 1986, his '87 Calgary Cannons version is easier to track down. 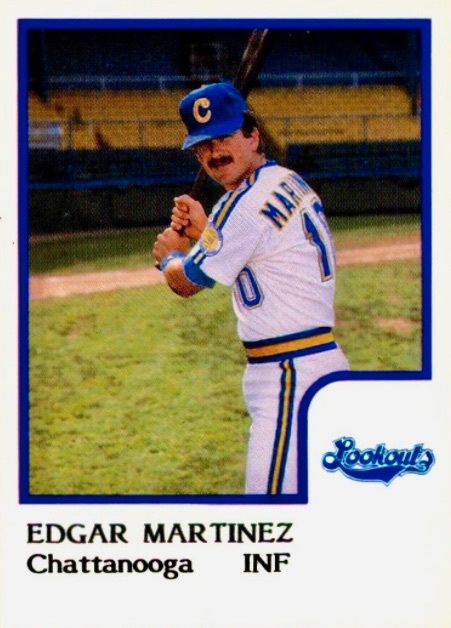 One of several Edgar Martinez prospect cards, the 1987 edition, shown on the left, features Martinez wearing the Cannons' "C" cap, which looks very similar to the Chicago Cubs logo. The earlier card from 1986 is featured on the right. Based in Canada, the Cannons were a Triple-A team for the Mariners through 1994. The minor league team was permanently disbanded in 2002. As the name of the set implies, 1993 Topps Finest brought together the finest players in baseball. Martinez certainly qualified as he was the AL batting champion in 1992 with a .343 average. Shown fielding on his card, Martinez won the Silver Slugger Award at third base in 1992 and added another four Silver Sluggers as a designated hitter throughout his career. The premium parallel in Finest, it is estimated that only about 241 Refractors are available of each card for collectors to fight over. The 1998 Donruss Signature Series set has a similar format to the famous 1997 set with its differently colored tiers of autographs that correspond to the number of cards signed. The most common signature is the red version, followed by the green Millennium Marks, and the blue Century Marks cards, which look particularly beautiful thanks to the Mariners color scheme. 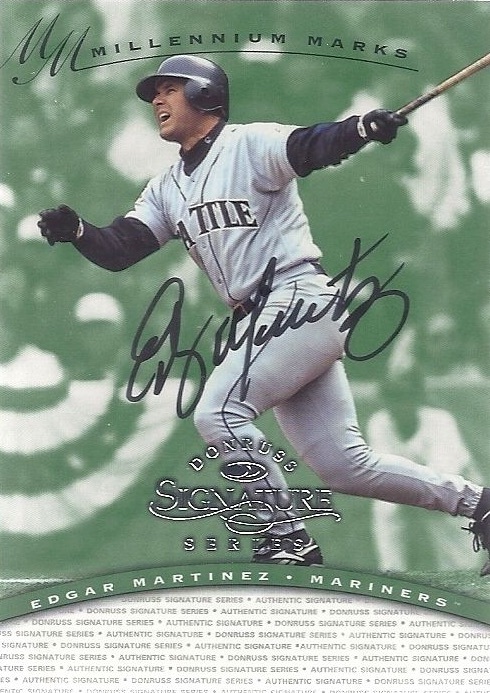 Martinez does appear in the 1997 Signature Series set but he signed his autograph in the wrong position on his photo rather than white signature area, as seen on the right below. Although these are some of the earliest Edgar Martinez autographs, they can also be in very limited supply for collectors looking to buy. He has since been included in many other sets, creating a good selection of signed options for Martinez on eBay. 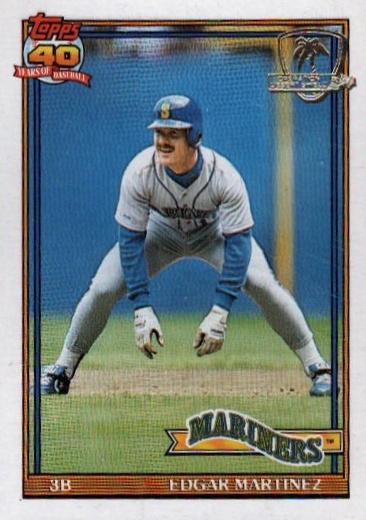 The key Edgar Martinez rookie card, it is hard to imagine that Martinez was only around 24 when he was photographed for 1988 Fleer as he looks just as he would for much of his career with his trademark mustache. The Glossy version of the main Fleer set was available only as a complete set and sold in a commemorative metal tin. It is estimated that 60,000 Fleer Glossy sets were issued in 1988 and gem-mint graded copies can top $40 at auction.